Newly Mastered in HD! 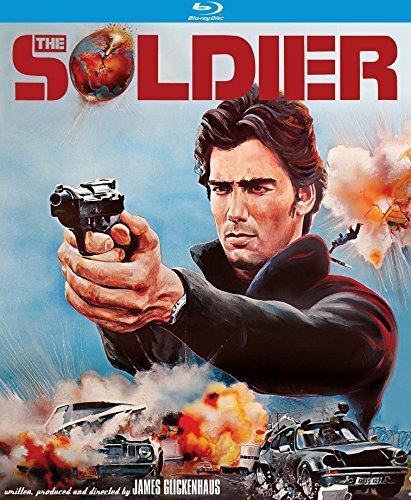 From writer/producer/director James Glickenhaus (The Exterminator, McBain, Shakedown) comes The Soldier a powerful action-packed thriller of global intrigue and espionage. KGB agents posing as terrorists steal enough plutonium to destroy half of the world s oil supply and threaten to do so unless the Israelis withdraw from the West Bank of Jordan. With the world on the brink of nuclear holocaust, The Soldier (Ken Wahl, The Taking of Beverly Hills), who's not part of the military, carries out his own unauthorized, illegal and highly dangerous plan to preserve the delicate balance of power. The Soldier is a relentless thrill ride loaded with some of cinema's most unusual and dangerous stunts. Music composed and performed by Tangerine Dream (Miracle Mile). The top-notch cast includes Alberta Watson (TV's La Femme Nikita), William Prince (The Gauntlet), Steve James (Avenging Force) and the great Klaus Kinski (Aguirre, the Wrath of God).